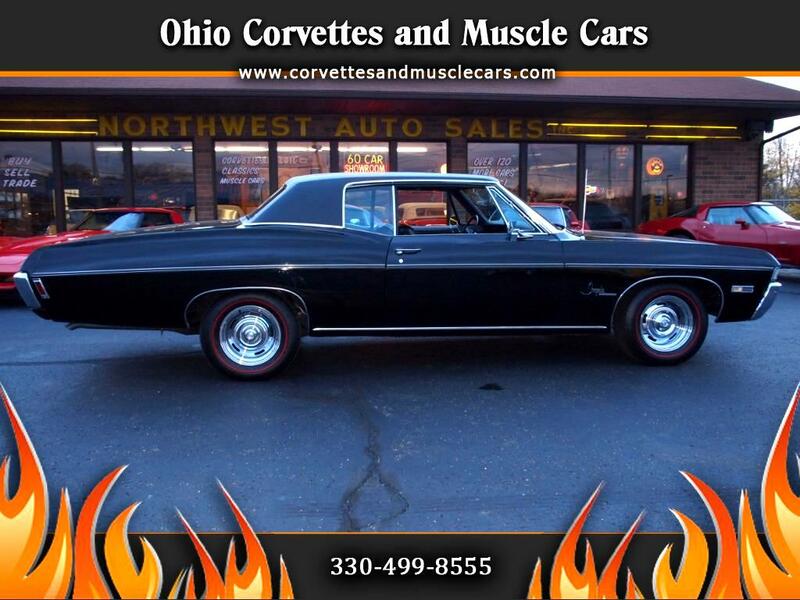 Our newest arrival is a triple black 1968 Chevrolet Impala Super Sport with a big block and a 4 speed. This is one cool car...a full sized Chevy with full sized power, which is supplied by a 396 / 325 hp big block mated to a factory Muncie 4 speed transmission. Mechanically excellent, this is a 'hop in and go' kinda car. It has no mechanical or structural issues, and all gauges work (except clock). Inside is the floor mounted 4 speed with console, like new bucket seats, and carpet with new Impala floor mats front and rear. A factory in dash tach keeps you informed as to whether you're over revving the big block power, and the air conditioning keeps you cool when the cops are chasing you through town. The black paint is near perfect and the chrome has maintained its original luster. If you like full sized muscle, you wont be disappointed with this beauty. Message: Thought you might be interested in this 1968 Chevrolet Impala.